I know it's not Thanksgiving yet... but I'm already baking Christmas cookies and giving them away to friends. My house may or may not be already fully decorated, too. 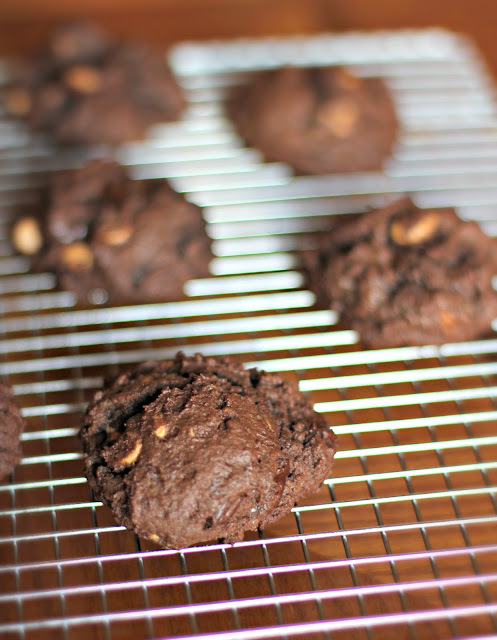 My first batch of cookies were these Double Chocolate Peanut Butter Chip Cookies. I know the pictures aren't great; I'm working on that. You have to believe me how good they are! They're very fudgy, rich, and soft. The cookies are loaded with lots of cocoa powder, butter, brown sugar, chocolate chips and peanut butter chips. I used a different technique with these babies - instead of creaming the butter with the sugar, I used cold cubed butter instead. It created a really interesting scone-like texture. I'm definitely going to try this again. Oh another thing, I found the peanut butter chips at Aldi! I've never seen them in there before. Go get em while you can. Any cookie requests for the holidays? Happy Thanksgiving, everyone! In a medium bowl, sift together flour, cocoa powder, baking soda, baking powder and salt. In a large mixing bowl, using a mixer on medium speed, mash together the butter and brown sugar until it forms a ball. Beat in eggs and vanilla until just combined. Reduce mixer speed to low and beat in dry ingredients until just combined. Stir in peanut butter chips and chocolate chips until combined. Dough will not be smooth! Don't you worry. 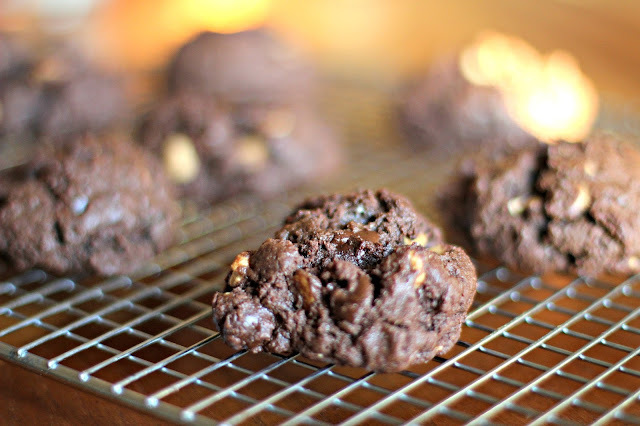 Scoop cookie dough out into heaping tablespoons full of dough and roll into balls. Place on plates and refrigerate/freeze until cold - about 1 hour. Heat oven to 350 degrees F. Place dough balls on cookie sheets, spacing about 1 inch apart. Bake 12 minutes or until set. Cool 2 minutes before transferring to wire racks to cool. 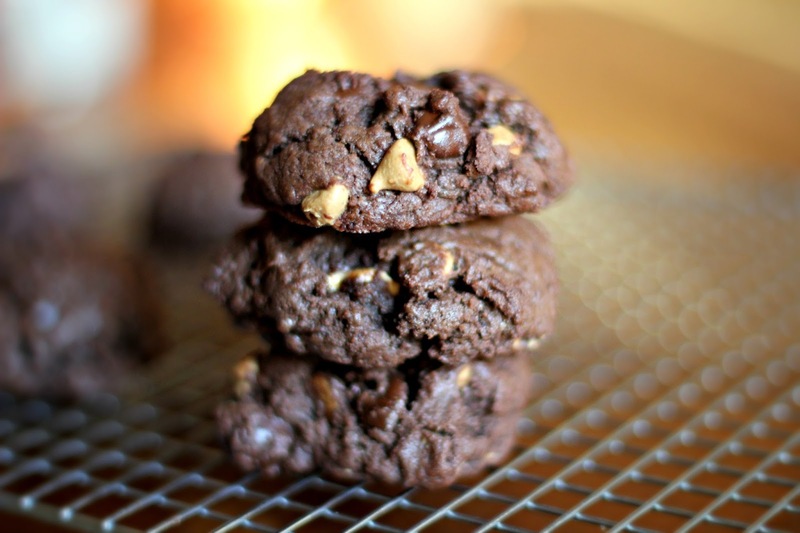 8 comments on "Double Chocolate Peanut Butter Chip Cookies"
Hi Emily! Have a great holiday....these cookies look great! I never have enough good cookie recipes! Happy Thanksgiving, Em. These look so yummy! I remember I used to bake multiple batches of cookies the day after Thanksgiving and then freeze them. That way at Christmas I could just put together little packages of Christmas cookies as gifts. I can't do that now that I'm married. Kevin hates it when I bake and give stuff away. I'm afraid he'd sneak into the freezer and eat whatever he wanted. It's not too early to plan for Christmas. I'm not making Thanksgiving dinner, but I am making Christmas dinner and I'm already obsessively making lists and game plans. I haven't baked yet. Christmas or no, I would LOVE these cookies! That's a great idea! If only I had a bigger freezer. Good luck with your Christmas dinner! I'm sure it will be delicious. These cookies look so gooey and rich and delicious!